The curious and the thrill-seeking rushed to their PCs as Microsoft unveiled the preview version of Windows 8.1 at its Build 2013 conference Wednesday. It’s free, but not quite anyone can get it yet. Microsoft promises that an ISO version of the preview will be available within the next day, but meanwhile, it’s available only through the Windows store—in other words, to Windows 8 and Windows RT users. Bah humbug! Update: The ISO became available midday Thursday, Pacific time. When it becomes available, the Windows 8.1 Preview ISO experience should be similar to running Windows in a virtual machine. In the meantime, here’s what Windows Store shoppers need to know to get the preview. Remember that Windows 8.1 Preview is a beta-level operating system that could break. At PCWorld labs, we've tried loading it on 5 systems and have already had one hang. Another, low-powered system is taking forever to chug through the process. Microsoft offers no technical support for the preview, just an online forum. Unless you enjoy danger, download this preview to a system other than your primary one. 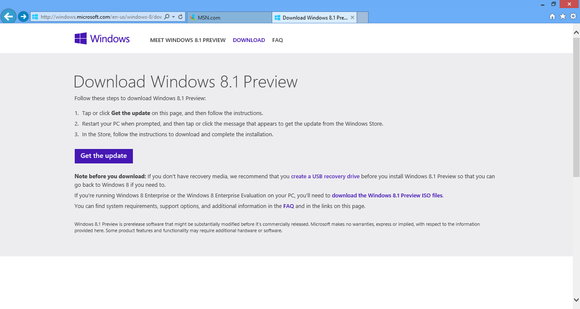 You should also back up the device and read the Windows 8.1 preview FAQs. The system requirements are the same as for current Windows 8 products: for starters, a 1GHz or faster processor and a MicrosoftDirectX 9 graphics device with WDDM driver. A 32-bit system will need 1GB of RAM and 16GB of storage space, while 64-bit systems will need 2GB of RAM and 20GB of storage space. For the Windows RT 8.1 Preview, you’ll need a device that’s already running Windows RT and also has 10 GB of free storage space. Windows RT users, please note: If you download the preview, there’s no going back—you won’t be able to restore your prior Windows RT operation system to the device. You will, however, be able to upgrade to the shipping version of the 8.1 update coming to Windows RT in the future. 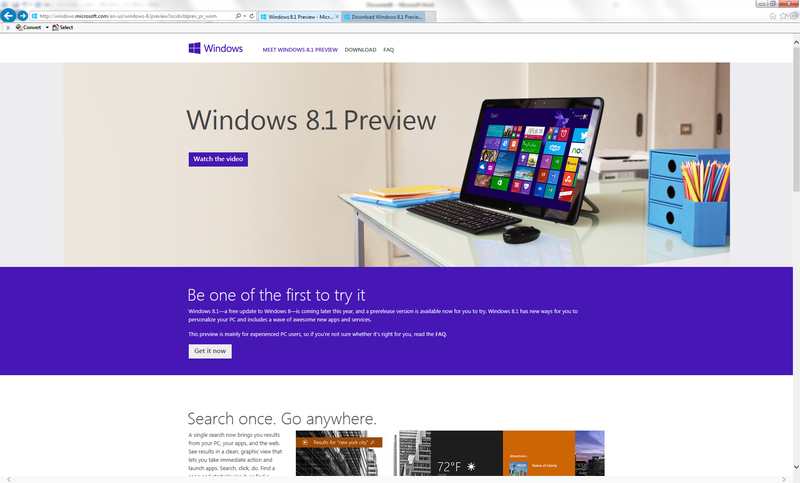 To start, go to preview.windows.com and click the 'Get it now' button. We tried the download on a Windows 8 system. You go to the Preview page and click the ‘Get it now’ button. On the next screen, click 'Get the update' to start downloading the first file. Once you've downloaded the first file and restarted your system, you should be able to find the Preview file in the Windows Store. 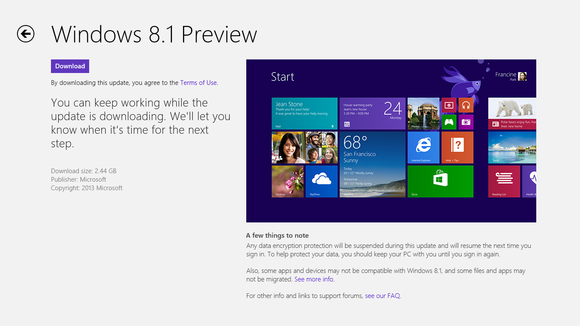 We’ve all been waiting for the Windows 8.1 Preview to arrive and restore our hopes for this operating system. Stay tuned for more reports on our initial experiences—and let us know what you think about it, too.